Few institutions seem more opposed than African American literature and J. Edgar Hoover's white-bread Federal Bureau of Investigation. But behind the scenes the FBI's hostility to black protest was energized by fear of and respect for black writing. Drawing on nearly 14,000 pages of newly released FBI files, F.B. Eyes exposes the Bureau's intimate policing of five decades of African American poems… , plays, essays, and novels. Starting in 1919, year one of Harlem's renaissance and Hoover's career at the Bureau, secretive FBI "e;ghostreaders"e; monitored the latest developments in African American letters. 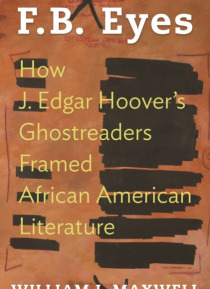 By the time of Hoover's death in 1972, these ghostreaders knew enough to simulate a sinister black literature of their own. The official aim behind the Bureau's close reading was to anticipate political unrest. Yet, as William J. Maxwell reveals, FBI surveillance came to influence the creation and public reception of African American literature in the heart of the twentieth century.Taking his title from Richard Wright's poem "e;The FB Eye Blues,"e; Maxwell details how the FBI threatened the international travels of African American writers and prepared to jail dozens of them in times of national emergency. All the same, he shows that the Bureau's paranoid style could prompt insightful criticism from Hoover's ghostreaders and creative replies from their literary targets. For authors such as Claude McKay, James Baldwin, and Sonia Sanchez, the suspicion that government spy-critics tracked their every word inspired rewarding stylistic experiments as well as disabling self-censorship.Illuminating both the serious harms of state surveillance and the ways in which imaginative writing can withstand and exploit it, F.B. Eyes is a groundbreaking account of a long-hidden dimension of African American literature.